Case against former Deputy Minister of Fisheries Sarath Kumara Gunaratne, over the alleged misappropriation of state funds amounting to nearly Rs 14 million, will be taken up for hearing on the 12th December as per order of the Colombo High Court. Presenting submissions before Colombo High Court Judge Shashi Mahendran, the defense counsels requested the High Court to issue an order to Presidential Secretariat to release a copy of the recommendations made by the Presidential Commission which checked into the alleged incident. Accordingly, the Judge passed an order requesting the Presidential Secretariat release a copy of the said documents. Defense counsel also requested the court to lift the travel ban imposed on the former Deputy Minister Gunaratne and the 6th defendant of the case, Sarda Munidasa until December 10th. Considering the request, Judge Mahendran temporarily lifted the travel ban on the aforementioned persons until 10th December and fixed the next hearing date to December 12th. 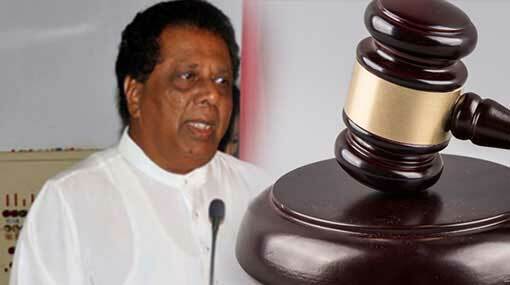 The Attorney General had filed the case against former Deputy Minister Sarath Kumara Gunaratne and five others for allegedly misappropriating nearly Rs 14 million, which had been allocated for the Negombo Lagoon Development Project, by using the funds for the election campaign of former President Mahinda Rajapaksa.